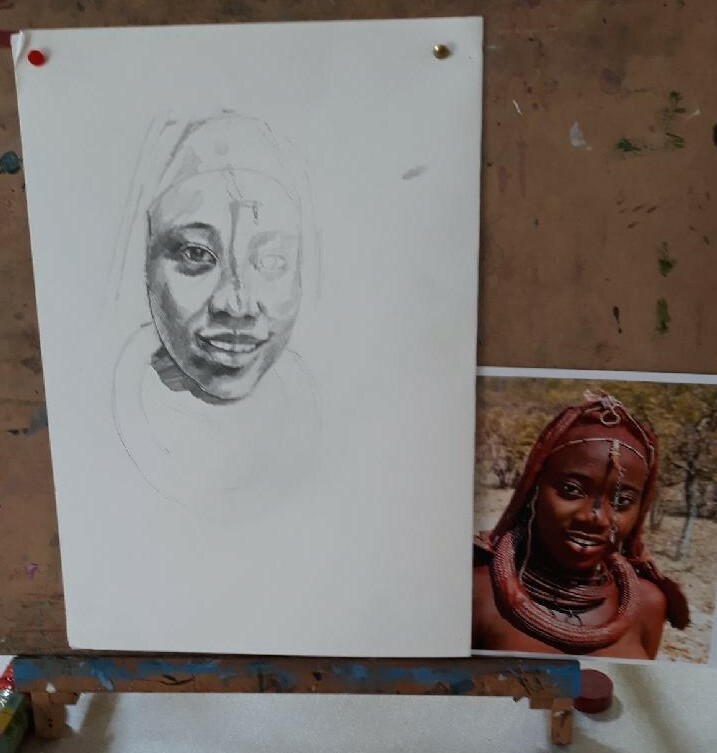 Caroline’s session today was a talk about how the use tonal values affect a painting, followed by a demonstration of how to build up tone in a pencil drawing. First Caroline showed us examples of the use of light and shade and colour in paintings by Norman Rockwell. He was an American artist who depicted everyday scenes of life in the USA in the 40’s, 50’s and 60’s. He used photographs and often set up scenes this way to capture an image he had in mind. The first example was a painting titled “Freedom from Want” 1943, which showed a family having a meal around a table. Caroline pointed out the way the use of dark colours drew the eye in to the picture. The male figure in a black suit in the centre contrasted with the woman next to him in white and the dark hair of the children and other adults around the table gave the picture a sense of fluidity. In many other paintings by Rockwell he used dominating dark or strong colours to draw the eye in while various paler colours are passed over by the eye. One particular picture showing two black children facing a group of white children in suburban area caused quite a bit of discussion among us, both in his use of colour and social commentary. It was painted in 1967 and reflected the racial tensions of the day. Caroline then demonstrated how to build up a pencil portrait concentrating on light and shade. First she lightly sketched in the features of the woman and her head gear, starting as she always does with the nose, moving on to the mouth and eyes and brow. She kept on taking account of the proportions by measuring with her pencil until she was satisfied with the placement. 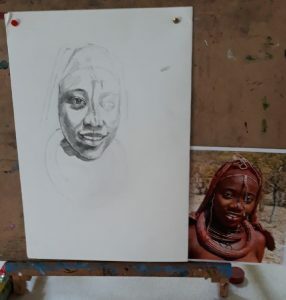 Then she lightly mapped out the dark areas first, for example the shadows on one side of the face and working round the face where features were in the shade. Darker lines were then added and some of the shading darkened too. Caroline said she liked to use a 7B pencil as it was nice and soft and sometimes she would use a 9B for strong, dark tones. It was advisable too, she said to keep in mind what you want the viewer to see and accentuate the focal points such as the eyes in a portrait. Many thanks to Judy, who took the above notes and photo at very short notice.